The offer sheet is a general manager’s nuclear option. It is rarely deployed. The Bruins didn’t sense Dougie Hamilton (left) wanted to stay in Boston long term, so Don Sweeney (right) shipped the young defenseman to Calgary. In a four-day span, a pair of 22-year-old franchise players said goodbye to organizations that didn’t want to see them go. If they aren’t there already, Dougie Hamilton and Brandon Saad will grow into stars as good as Victor Hedman and Jamie Benn. Teams do not willingly trade players of this quality. In both cases, the threat of an offer sheet, which became viable on Wednesday, played a part in sending their previous employers sprinting for the trade button. The offer sheet is a general manager’s nuclear option. It is rarely deployed. The last time it happened was when Calgary signed Ryan O’Reilly to a two-year, $10 million offer sheet on Feb. 28, 2013. The Avalanche matched. Before that, Philadelphia signed Shea Weber to a 14-year, $110 million offer sheet on July 18, 2012. Nashville also matched. The last time a club declined to match was when Dustin Penner signed a five-year, $21.5 million offer sheet with Edmonton in 2007. Not only did Anaheim say no, former general manager Brian Burke went full bazooka on Edmonton counterpart Kevin Lowe, blasting him for using a mechanism that blew salary structure apart. No GM pulled the trigger on signing Hamilton or Saad to an offer sheet. But there was plenty of rumbling that it could happen. The Bruins and Blackhawks were tight against the ceiling, vulnerable to the ramifications of an offer sheet. Free agency is no longer as suitable a team-building option as it once was because of the shrinking number of good players. It’s why some teams’ muscle-flexing forced the Bruins and Blackhawks to trade their young stars. The Bruins knew that former GM Peter Chiarelli would not have hesitated to sign Hamilton to an offer sheet. Had that happened, the Bruins would have lost Hamilton for 2016 picks, or been forced to match at a cost that upset their cap. In Hamilton’s case, the threat of the offer sheet was not the only reason the Bruins sent him to Calgary. Based on his six-year, $34.5 million extension with Calgary, a sum that was within the parameters of one of the Bruins’ offers in both term and salary, Hamilton didn’t want to stay. The Bruins had reservations about re-upping a 22-year-old who wanted out. But they were also scared of the $7,305,316 threshold. If the offer sheet came in at or under that tier and the Bruins declined to match, they would have received first-, second-, and third-round picks as compensation. If the offer sheet was more than $7,305,316 and the Bruins said no, they would have netted two first-rounders, one second-rounder, and one third-round pick. A smart GM, therefore, would have signed Hamilton to an offer sheet just under the threshold. The dollar amounts in the NHL’s RFA compensation chart have risen since 2012-13, the first year of the current collective bargaining agreement. That year, the threshold for first-, second-, and third-round picks was $6,728,781. The compensation has not risen correspondingly. The compensation was much richer in the previous CBA. Before the 2012-13 lockout, if a team declined to match an offer sheet worth $5 million or more, the compensation was four first-round picks. Under the current CBA, the four-pick threshold is $9,131,645. Few teams, if any, are willing to part with their first-rounders for four straight drafts, regardless of the targeted player’s skill. Unlike Hamilton, Saad didn’t want to leave. But the top-line left wing also wanted to be paid. After he got a sense of Saad’s initial ask, GM Stan Bowman recognized the spread was so wide that negotiating would have been a waste of time. The Blackhawks would have preferred to trade Bryan Bickell. But they also knew that if July 1 came and Saad remained Chicago property, he was a primary target for an offer sheet. Like the Bruins, the Blackhawks didn’t want 2016 picks. They had liked Artem Anisimov for a long time. So on Tuesday, Bowman traded Saad, Michael Paliotta, and Alex Broadhurst to Columbus in a package that brought back Anisimov, Marko Dano, Jeremy Morin, Corey Tropp, and a 2016 fourth-rounder. Chicago extended Anisimov with plans of making him the No. 2 center. But the Blue Jackets landed the best player in the deal. Columbus GM Jarmo Kekalainen said he was not prepared to sign Saad to an offer sheet. Kekalainen, however, was the beneficiary of Chicago’s fear. The Jackets had the trade assets that Chicago wanted. On Friday, the Jackets signed Saad to a six-year, $36 million contract. Saad is likely to be Ryan Johansen’s left wing. Johansen, Boone Jenner, and Ryan Murray will all be restricted at the end of their current deals. When that happens, they could become candidates to sign offer sheets, especially Johansen, Columbus’s franchise pivot. Martin Jones signed a three-year, $9 million contract with San Jose. Consider the assets that were traded in the last 10 days: Milan Lucic, prospect Sean Kuraly, two first-round picks, a second-round pick, two third-round picks, and two seventh-round picks. That’s a whole lot of collateral changing hands for four backup goalies with no future with their previous clubs: Martin Jones, Cam Talbot, Robin Lehner, and Eddie Lack. The lesson: It’s always smart to invest in players who can stop the puck. Even if they’re not in your long-term plans, you can flip them for assets. Goaltending is hockey’s most important position. As such, teams are always hunting for trustworthy goalies, especially inexpensive ones. The four goalies involved in the trades had several things in common. They were backups. They were cheap. And they have No. 1 potential. In Los Angeles, Jones was parked behind Jonathan Quick. The Bruins landed Jones as part of the Lucic trade. They planned to sign Jones as their No. 2 behind Tuukka Rask. But Jones wanted to be a starter. By switching coasts, Jones would have been in the same situation: stuck behind an ace. So Jones was flipped back to California. In San Jose, Jones quickly signed a three-year, $9 million contract, which would have been a pricey investment for the Bruins in conjunction with Rask’s $7 million average annual value. Jones will replace Antti Niemi as the No. 1. It was the second time the Kings flipped one of Quick’s backups. 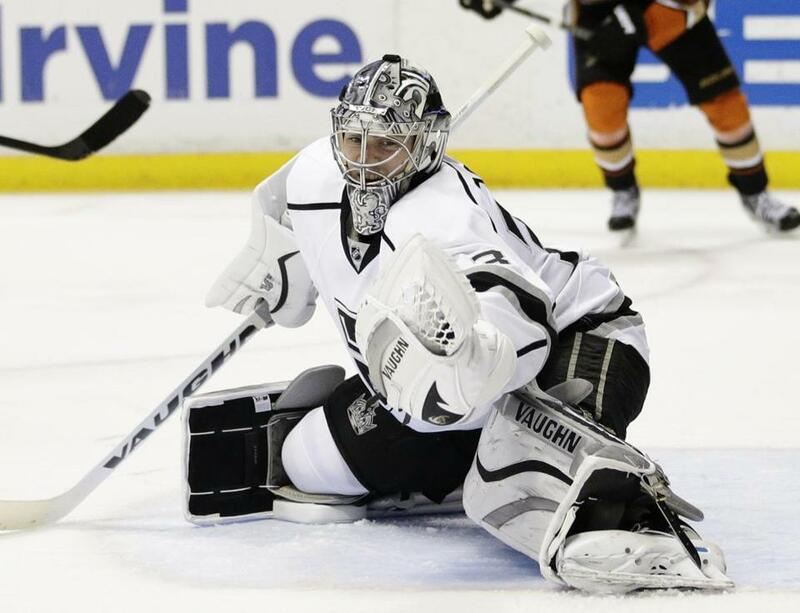 On June 23, 2013, LA traded Jonathan Bernier to Toronto for Ben Scrivens, Matt Frattin, and a second-round pick in 2015. The Kings have received assets for two backups because they’ve identified good young goalies and developed them well. Now Jean-Francois Berube, who won the Calder Cup with Manchester, will fight to be Quick’s No. 2. Talbot was like Jones: trapped behind a franchise goalie in Henrik Lundqvist. Lehner became the odd goalie out after the Senators re-signed Andrew Hammond as Craig Anderson’s backup. Lack was Vancouver’s moveable commodity because of Ryan Miller’s untradeable contract and Jacob Markstrom’s development as a potential No. 2. 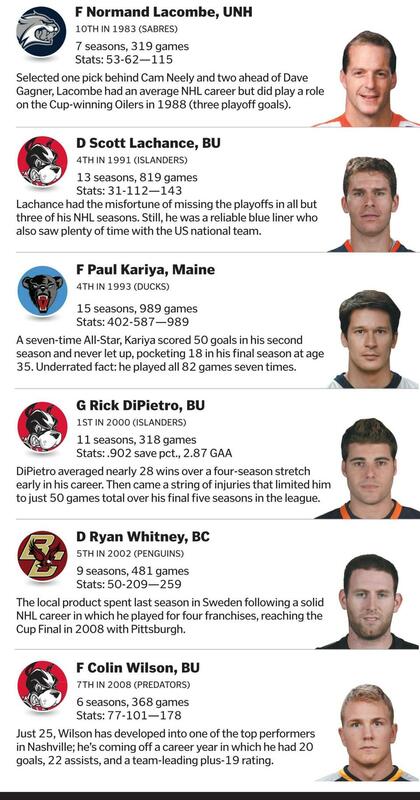 The Bruins could be in this situation in several years. Rask isn’t going anywhere. They have two prospects in Malcolm Subban and Zane McIntyre. Assuming they develop in Providence, one of the two could become an asset. Strength in goal isn’t just helpful for a team. It’s also good business. 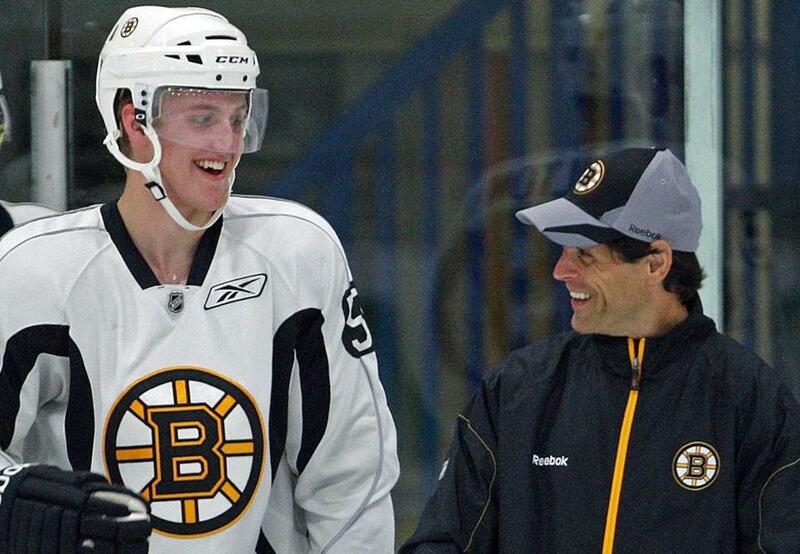 Jay Pandolfo (left) is the only Bruins’ coach dedicated to development. 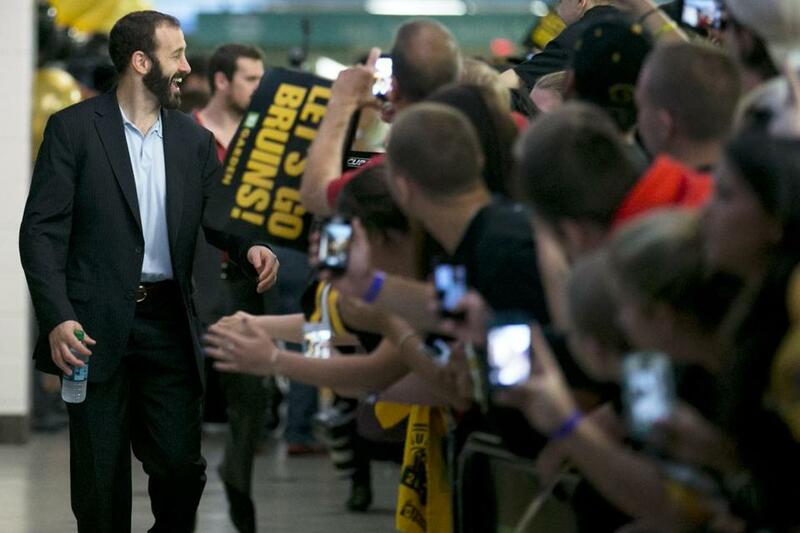 At this stage, the Bruins prefer a primary point person for development. While goaltending coach Bob Essensa regularly works with the club’s AHL goalies, Pandolfo is the only coach dedicated to development. Other clubs have chosen to invest more heavily in this department. Los Angeles, for example, is considered the league’s best in drafting and developing. It has a four-man development staff: Nelson Emerson, Mike Donnelly, Mike O’Connell, and Glen Murray. Before he was hired by Philadelphia, Kim Dillabaugh was the team’s goaltender development coach. LA’s amateur scouting staff, led by Mark Yannetti, is also involved in development. Some teams have their scouts hand off their picks to their development colleagues. Yannetti and his group remain involved in the development process. Chicago has a similar setup. Barry Smith is the director of player development. Smith oversees a staff that includes a coach dedicated to skating and skills development (Kevin Delaney), goaltending (Andrew Allen), and players (Mark Eaton, Yanic Perreault, Anders Sorensen). Marshfield native Mike Sullivan, recently hired as Wilkes-Barre/Scranton’s coach, previously worked in Chicago’s development group. Development is critical in a cap landscape. Teams require picks to mature into consistent NHL players while still on their entry-level contracts. Development personnel are usually the good cops in the process. They’re the ones pumping the players’ tires off the ice while their coaches are grinding them through their paces. Today’s players thrive on positivity. On Wednesday, Neely said there are no plans to hire more personnel for the Bruins’ development staff. However, Neely acknowledged he and his colleagues have been busy with other matters. It may be an area the Bruins supplement in the future. Had Martin St. Louis not shredded the NHL until his retirement on Thursday, it’s possible that undersized players such as Tyler Johnson, his former Lightning teammate, would still be knocking on the league’s door. St. Louis was ready to enter the NHL when its stewards were at the height of Stone Age thinking. Everybody wanted size. Nobody wanted anything to do with a 5-foot-8-inch wing coming out of the ECAC. It didn’t matter that St. Louis was one of the more dynamic college players of his time. In his draft year, St. Louis had 15 goals and 36 assists as a University of Vermont freshman. Still, no team considered it worthwhile to use a low-round pick on St. Louis. Sixteen NHL seasons later, St. Louis (391 goals, 642 assists, 1,134 games, one Stanley Cup) proved to his doubters that skill, speed, smarts, and tenacity do more than enough to make up for 4 inches in height. The NHL is starting to punt its prejudices. St. Louis helped make that happen. Dougie Hamilton is the Flames’ No. 3 blueliner behind T.J. Brodie (above) and Mark Giordano. By acquiring Dougie Hamilton, the Flames now have the deepest blue line in the league. On their depth chart, Hamilton is No. 3 behind Mark Giordano and T.J. Brodie. Ex-Bruin Dennis Wideman, Kris Russell, and Deryk Engelland round out the six-pack. “In a lot of ways, our blue line carried our team,” Calgary GM Brad Treliving said in a conference call announcing Hamilton’s extension. “Not only just in terms of their play, but a lot of nights, they drove our offense as well. To add a player like Dougie into that mix, you not only look at what he brings, but how it complements the rest of the group. It gives us another tool in the toolbox for the coaching staff to distribute minutes.” Hamilton is also an internal asset in case negotiations with Giordano go sideways. The No. 1 defenseman will be unrestricted next July 1. He has an average annual value of only $4 million. This will be the 31-year-old Giordano’s final swing at a blockbuster deal. He’ll want big money and term, especially after suffering a season-ending biceps injury in 2014-15. 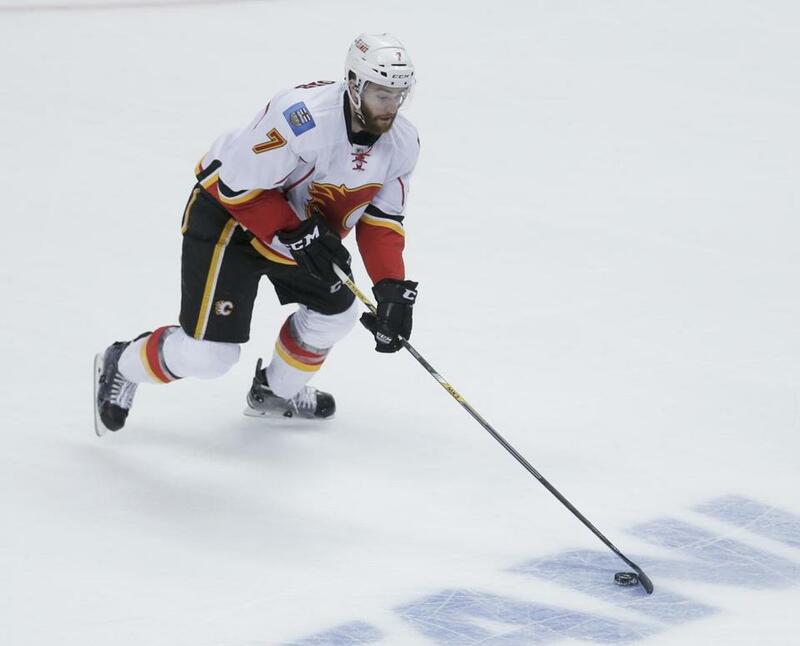 Re-signing Giordano is Calgary’s priority. But talks could always break down. If so, Hamilton is a good Plan B. The Flyers and Bruins saved themselves some long-term injury exception worries by trading Chris Pronger to the Coyotes and Marc Savard to the Panthers, respectively. Arizona and Florida, two budget teams, benefit from applying the injured players’ average annual values ($4,941,429 for Pronger, $4,027,143 for Savard) toward their respective climbs to the $52.8 million cap floor. Columbus did something similar last year by trading Nathan Horton to Toronto. In turn, the Leafs traded David Clarkson and his anchor of a contract to Columbus. Other injured players who could be moved include Mattias Ohlund. The injured Tampa defenseman carries a $3,607,143 annual cap hit, according to generalfanager.com. Ohlund is due $1 million in salary in 2015-16. The Jets brought back Alexander Burmistrov on Wednesday, signing their 2010 first-round pick to a two-year, $3.1 million deal. Burmistrov bolted for the KHL after 2012-13, when Claude Noel was Winnipeg’s coach. The skilled 23-year-old will get a clean start under Paul Maurice . . . The Canadiens have not been quick to improve their team. Zack Kassian, acquired from Vancouver for Brandon Prust, is a project. GM Marc Bergevin also has to re-sign Alex Galchenyuk. If Carey Price dips at all, Montreal will be in trouble . . . For the Blues, trading T.J. Oshie to Washington was as much about shaking up the room as it was about improving the roster. Troy Brouwer is a good player. But moving Oshie should signal to the rest of the group that another first-round exit was not acceptable . . . In 2006-07, Peter Chiarelli, Don Sweeney, Jim Benning, and Jeff Gorton were Bruins colleagues. They’re all GMs now, with Gorton becoming the latest to join the club after replacing the Rangers’ Glen Sather on Wednesday. Boston has always been a launchpad for brainpower, in hockey and other industries.